Now Mrs A has informed us that Xanthine is the yellow colour matter found in certain plants such as Yellow madder, so for this challenge she is looking for some yellow butterflies and other splashes of yellow. Yellow is not a colour I use very often in my craft, but diving in at the deep end, I found some yellow card and made a 15cm square base card. I wanted to lighten it a bit so that I could put yellow butterflies on it, so I found an off-cut of deep cream paper to make a mat and embossed it with a We R memory keepers, Next level embossing folder - Woven. These Next Level folders give a really deep multi-faceted texture to paper and card, and are fabulous for large mat layers on cards. (Sorry, I took the photo in artificial light and it is not very clear). I coloured the edge with Picked raspberry DI and glued it to the base card, having first rounded the corners on both the card and the mat with a corner punch. 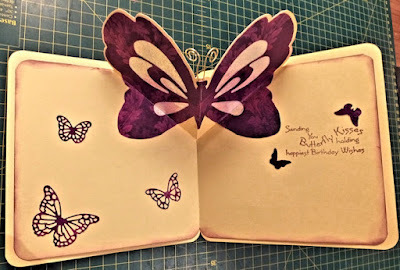 I used a sheet of deep pink patterned paper to die cut the butterfly border. The die is bright pink so I think it is from Joy Craft. Next I used the same paper to cut a medallion using a sizzix die, ready for the sentiment. This was another new technique that I have been wanting to try - foiling. There are some expensive machines on the market for this, which I can't justify buying right now, but I had a seen a video of it being done using a laser printer and a laminating machine, both of which I had access to. So I used a sentiment from my digistamps, and resized it to fit in a 4cm circle. I added a few more to the page for future use, and took it down to my husbands office to print on his laser printer. Then I placed hot pink foil on some of them, and dark gold on the others, folded a sheet of copier paper around it as a carrier sheet, and passed it through my laminator. When I peeled away the remains of the foil, and used a soft brush to tidy it up, I was left with some satisfactory gilded sentiments. They were not covered perfectly, but my laminator was very cheap and performs accordingly, and I think it was not really hot enough. But the pink ones (typically this was from a set of very cheap foils that I bought in a bargain bin), worked much better than the gold - a rather expensive foil sold for hot foiling! But it was a pink one I wanted for this card, so I cut it out with a plain circle die, coloured the edges to match the other elements and glued it to the centre of my medallion, and added it to the card front. I then decorated the rest of the card with thick shiny yellow flower stickers and an assortment of yellow and pink butterfly stickers. The main yellow butterfly was a double layer card one that I found in my stash - origin unknown! It was rather pale so I dusted it with fosilized amber DI and edged it with a purple copic marker. It has a pretty pattern in glitter on it, but this doesn't show in the photo. The tiny stickers are so old it is a wonder they are not all grey by now! If you are still with me I will show you the inside of my card. On my birthday back in October I was given a pretty floral card with a large pink flower that popped up inside when you opened it. I wanted to have a go at making something similar, so I used an old photo of a crafted butterfly and imported it into my Silhouette software, where I made it into a cutting file, laid it over a rectangular base and welded it it all together. 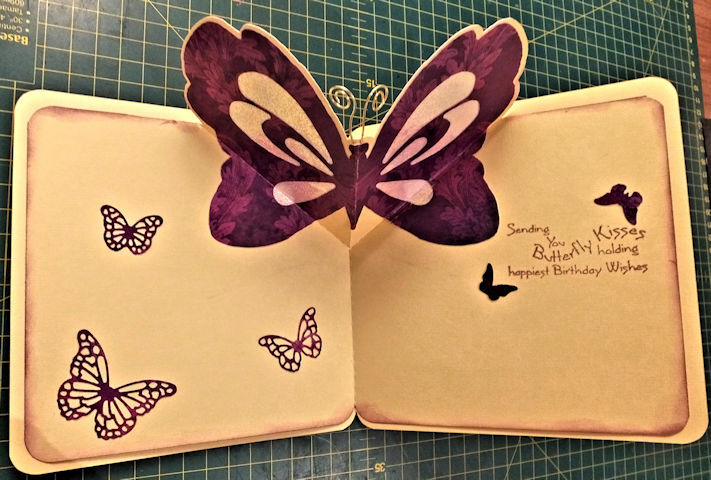 I made a matching butterfly file with cut-outs in its wings, and resized them to fit inside my card. I cut the main piece from the same card as the front, with a 1cm border all round it. I again rounded the corners and coloured the edged with the picked raspberry DI. I cut the top layer of the butterfly from more of the pink paper, and used a snippet of pink/white irridescent paper behind the wings. I then adhered it to the inner card and made sure it could bend where it needed to. I fixed the insert inside the card along the spine, and when I was sure it was all working right I glued along the two sides. I added some openwork pink butterflies cut with a Memory box die, and trimmed a couple of tiny ones from the off-cuts of the front border. The sentiment is an un-named clear stamp, from back in the days when I didn't appreciate the need to label everything! Now I will link this up with Mrs A's Butterfly Challenge, and as I used off-cuts of cream paper for the mat and irridescent paper for the wings, I will also fly over with it to Pixie's Snippets Playground. That is my first proper project since I stopped way before Christmas, and it is good to get back in the swing of things. Fabulous card Kate! I've been wanting to try out the foiling the way you did it too - certainly you got good results! Wow . . . thats a TERRIFIC card Kate. Lots of detail and then the big surprise inside. SUPER! What a wonderfully pretty card, love it!! Gosh Kate this is stunning. Your card goes way, way beyond the call of duty! I love every last detail. I'm in total awe of you taking all the way to your husbands office just to use the machine in there!!. 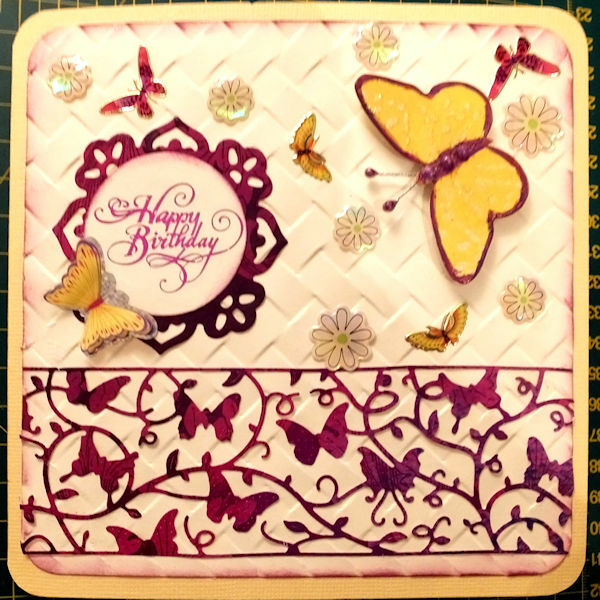 Gorgeous tellis embossing and I love the lattice work of butterflies. Thankyou for fluttering by my#45 challenge and brightening this pretty disamal grey day here in the UK. Hugs Mrs A.
Oh, wow!! I'm in love with your card! It's wonderful!!! 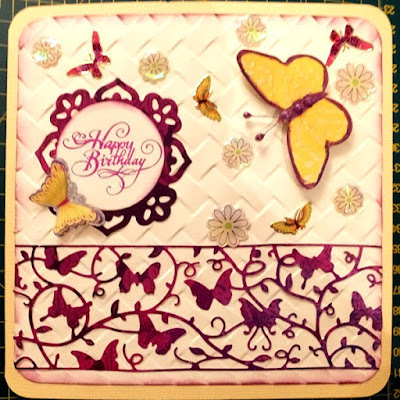 Love the embossed backgound, the butterflies border, the yellow butterfly and the foiling, they look really great!! And the inside is a true surprise with the popup butterfly!! Just fabulous! The fluttering sentiment is just perfect for this card! This is a piece of art! This is fabulous, Kate. Great idea you have shared regarding the foiling!